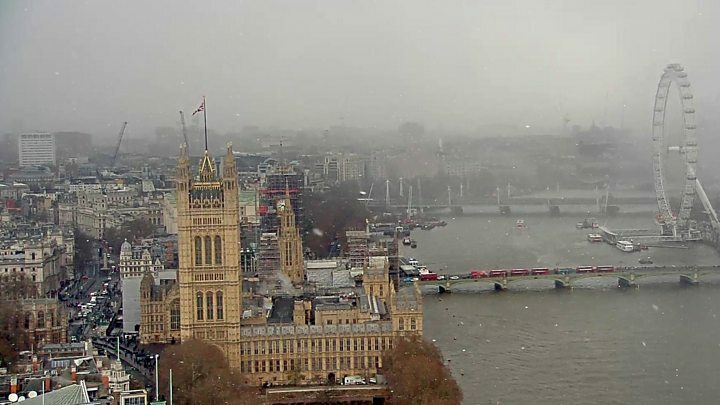 Snow is falling across parts of the UK as very cold air sweeps in from Russia. Heavy snow is expected across southern and eastern England overnight on Monday – with warnings extending into the Midlands, Scotland and Wales on Tuesday morning. 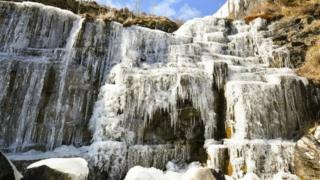 Many areas have been hit by freezing temperatures, with a wind chill making it feel like -15C in some places. Rail firms have warned of disruption, with many planning to run a reduced service overnight and on Tuesday. A snow emergency was declared in Kent and the council urged people not to contact it unless there is an emergency. Heavy snow is forecast for much of Yorkshire, Teesside, Durham and Newcastle in the early hours of Tuesday morning, which is likely to cause delays on the roads, the Met Office said. A warning is also in place for London and parts of the South East on Tuesday, with the possibility of delays and cancellations on travel networks as well as power cuts in rural areas. Snow warnings have been issued for the whole of Wales, with temperatures expected to fall to -5C, the Met Office says. 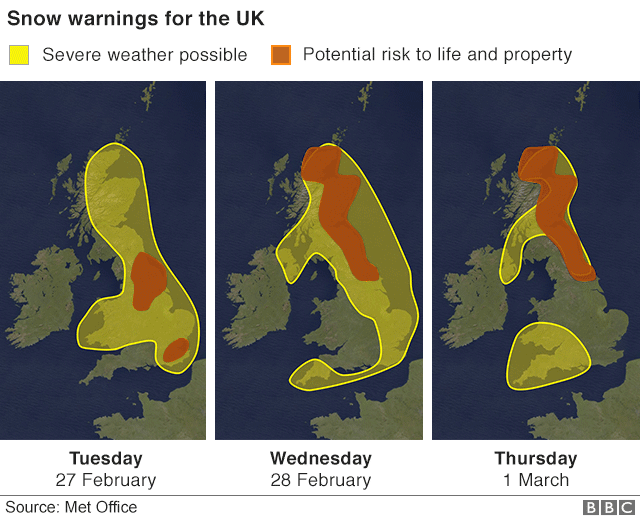 The Met Office has both yellow warnings and more serious amber warnings – meaning there is a potential risk to life and property – for large parts of the UK for the rest of the week. Meanwhile, Heathrow and Gatwick airports say they are not expecting delays today, but urged anyone flying later in the week to check the status of their flight with airlines. 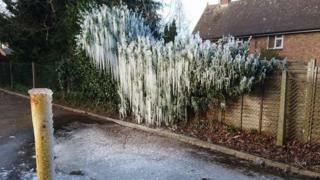 Image caption A burst water pipe in Highworth, Wiltshire created this icy display. Weather warnings on Wednesday and Thursday’s will also cover Cornwall, Scotland and Northern Ireland. By Wednesday night, more than 20cm (8ins) of snow could have accumulated in some parts of eastern England and Northern Ireland, forecasters have warned. Scotland is expected to have between 5cm (2ins) 10and 10cm (4ins) of snow on Wednesday. 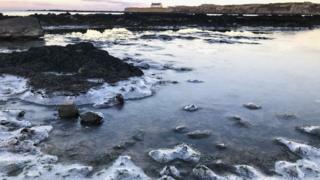 The Met Office is predicting that some roads may become impassable and vehicles may be stranded. 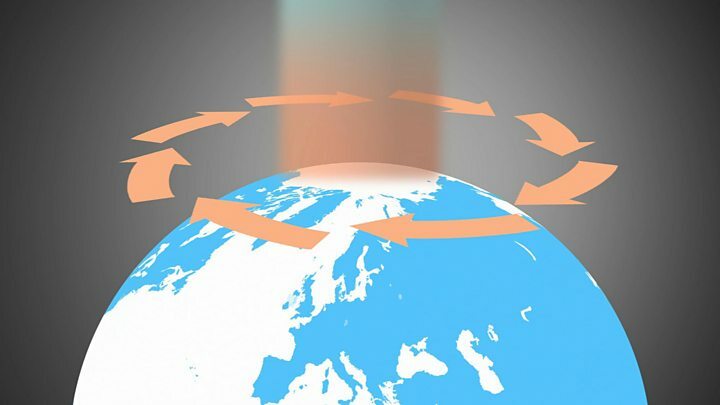 BBC Weather has warned of possibly hazardous conditions in southern England later in the week as a low pressure weather system moves up from the Bay of Biscay and hits the already “exceptionally cold air”. He added that while he did not want to alarm people, the Met Office was urging people to be prepared for the so-called “beast from the East”. Parts of the UK will feel as cold as Norway and Iceland. When surface temperatures are below freezing, snow is drier as it contains less water. 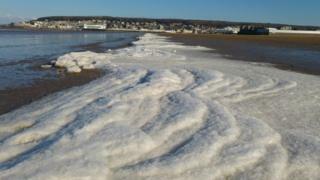 This type of snow is powdery and does not stick together, the Met Office says. Wet snow however, is the result of slightly warmer, moist air, which causes the edge of snowflakes to melt and stick together. Public Health England have advised homes to be heated to at least 18C. Emergency shelters have been opened across the country as councils offer extra accommodation to the homeless during the freezing conditions. The offer of a hot shower, clean clothes, food and a bed can help save lives, homeless charity St Mungo’s said. We would like to hear your experiences in the cold weather. Please send your comments and pictures to: [email protected].